Although the armholes of my first Myrtle Dress were WAY too tight I really loved the dress and was gung-ho to make myself another one ASAP. 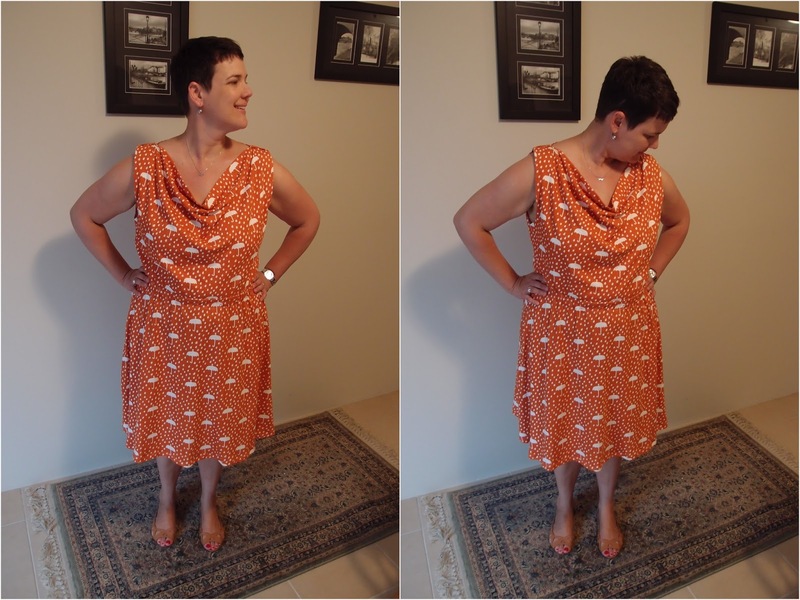 At our recent Spoolettes sewing day my Sewing Yoda, Susan from Measure Twice Cut Once had a look at the dress on me and made a few simple changes to the pattern. She reduced the armhole from an XL to L and dropped the finishing spot of the armhole by 2cm. Simples. I went home and knocked up a toile of the new bodice and attached the skirt to it as I think the skirt is necessary for the toile as the weight of the skirt pulls the top down somewhat and gives a true indication of what the finished garment would look like. This was a SHAMEFUL piece of lazy, haphazard sewing with a super slinky fabric that made me want to jump off our balcony. But it did reveal the armholes were VERY comfortable now, though possibly slightly too low under the arm (fine everywhere else though). I wasn't really sure if I should raise the armholes up a bit so went ahead anyway to sew my next Myrtle with this fun, 100% cotton jersey from Spotlight. This umbrella/raindrop clad fabric is pretty appropriate for the current Sydney weather that has been non-stop rain for about 2 weeks. On the plus side this fabric sewed like a DREAM (though was really hard to iron for some reason - the iron would not glide over the fabric like it should do) however it is quite stiff and I have to say I'm not in love with the fabric or this dress...I probably won't wear it be honest. Look how STIFF the cowl is. I also totally botched the hem and am still tramatiesed when I look at it (FYI, heat + bond is THE enemy)! 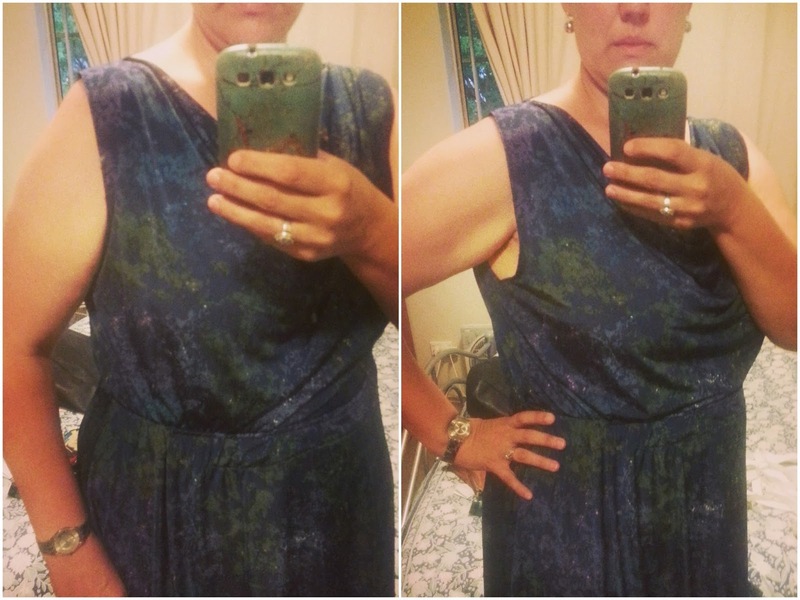 With this version of the dress can also confirm with me 100% that the armholes are too big. The are fine at the front and back, but just too low under the old armpit there. When I tried on the finished garment the stiffness of the fabric was making the shoulders really stick out....in a very bad, 80s "hairband" kind of way, so I jimmied up a makeshift tab in order to contain the shoulders. It took a few goes to get this right, and it's not very neat on the inside, but it's what on the outside that counts...right? So whilst I don't "love" this particular Myrtle, I do love this pattern and I've already adjusted the pattern and made my next version...so watch this space for more Myrtle Mania coming soon! 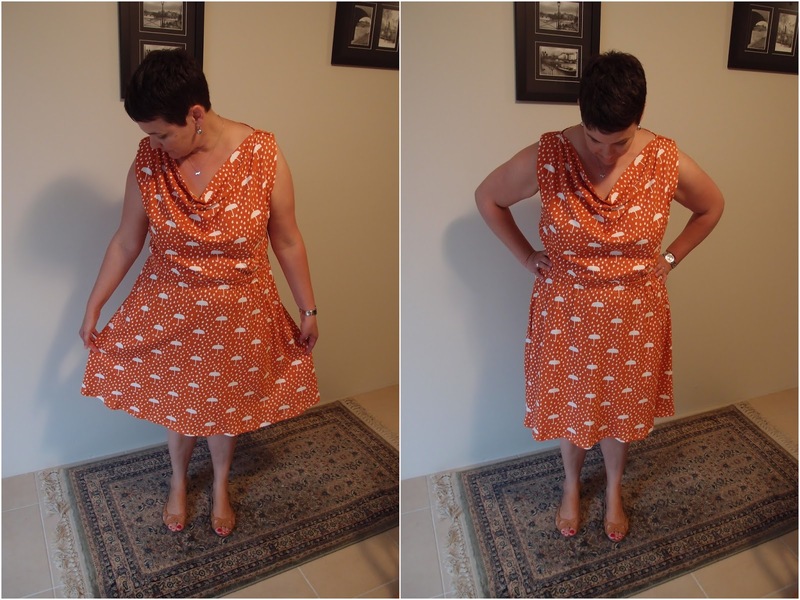 Modifications: Reduced armhole front and back from XL to L; and dropped the underarm by 2cm. 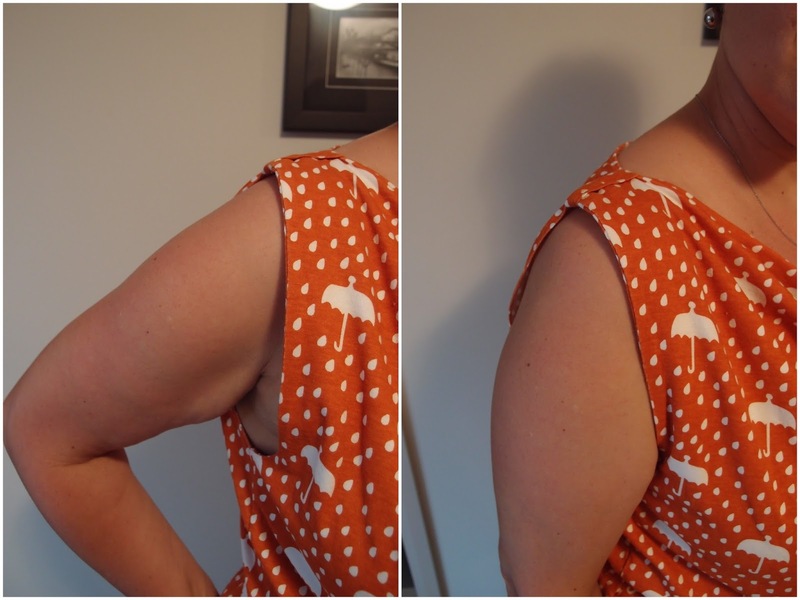 Changes for next time: raise armholes by 1cm. Love the fabric and love the shoulder tabs! Bummer that you aren't that into the finished dress because it really is very pretty. Can you turn it into a skirt to save the fabric? Those shoulder tabs are a great feature, intentional or not! Great fabric too!! I say this every time - but have to keep saying it in this instance: it looks great in the pics! Yeah can see the low arm hole thing but this could be a great dress with a cardi for autumn. Now for something new gazi gazi gazi! My dear, this is one fine looking frock! If you're at this stage with your fitting tweaks you are becoming quite the knit queen! I like the cowl on this and the arm bands- I think they make it look great! Yeah, the photos make this dress look better than it actually is. Into the recycling bad for this one! You'll be seeing me in Leona at Gazi no doubt! I really don't love the "feel" of the fabric. Pity as the print is uber cute. clever idea to add the little gathering tab, i love the fabric too! Good to see your getting to make so many dresses though. practice makes perfect!